In a quest for perfect produce, Eberhad Müller of New York city's Lutece goes to extremes: he growes his own. Here he shares eight simple recipes for the season's best. Even in the world of top New York chefs, where choice ingredients are perennially sought after, Eberhard Müller is a bit extreme. Sixteen years ago, when the young German chef was newly arrived from the kitchens of Paris and cooking at Windows on the World, he searched the coast of Maine for just-out-of -water fish and the gardens of New Jersey for the sweetest tomatoes. And despite the exorbitant prices, he was one of the first to fly mesclun and other fresh produce in from California. Three years after that, as chef at Le Bernardin - the country's best ( and probably best-known) seafood restaurant - he embarked on a project of visiting all his suppliers. That was when I met him; he invited me on a winter tour of the nearly frozen waters off Nantucket to check on his source of bay scallps. Several years later Müller announced he was leaving to open a restaurant in Southern California. Why? The answer was simple: "I want to be where the vegetables come from." It was his belief then, as it is now, that while complicated dishes may hide flawed components, simple ones cannot. "If I am making dishes with 10 ingredients or less, those ingredients simply must be perfect." In 1994 he returned to New York to take over as chef (and part-owner) at Lutece. In 1996 he became engaged to Paulette Satur, a wine consultant with degrees in horticulture and plant physiology, who had grown up on a farm in central Pennsylvania. "I spent my twenties trying to get back to one." It had taken her six years to locate the right property. As luck would have it, she found her new farm - on Long Island's North Fork, once one of the country's best potato-growing areas and now an up-and-coming wine region - on the day after Müller propsed to her. Müller himself grew up in a farming community in the Black Forest. Last summer at Satur Farms, as the newlyweds named the place, he was back at the source. 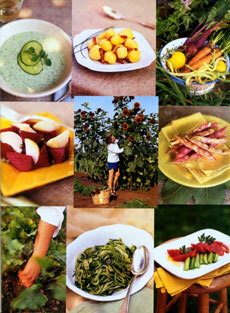 "All the great country chefs of Europe had their gardens to supply their restaurants, " he points out. He plans to grow as much of the produce as he can for Lutece and ultimately to sell any surplus to his fellow chefs. He made his first sale last year, to Julian Niccolini and Christian Albin, his colleagues and competitors at The Four Seasons. But it isn't only the business of growing that has Müller fired up, it's the notion of growing vegetables that he can cook at home. "Late last summer, I harvested some leeks at six o'clock, poached them and served them with a simple vinaigrette at eight, " he recalls. "It was one of the grates dishes I've ever made."